If you’re one of many who thought that a flat roof was, well … flat, you can be forgiven for not knowing that no roof is actually perfectly flat. A slope, however slight, is essential to ensuring that a roof will drain and not accumulate water — a condition known as “ponding”. Another more accurate name for a so-called flat roof is “low-slope”. A low-slope roof is a roof that rises 3 inches or less per horizontal foot, as defined by the National Roofing Contractors Association. A roof’s pitch determines the type of roofing system and materials that are most suitable for your building’s design. More than anything else, a roof’s slope determines how a roofing system will perform over time and how well and quickly it will shed water. 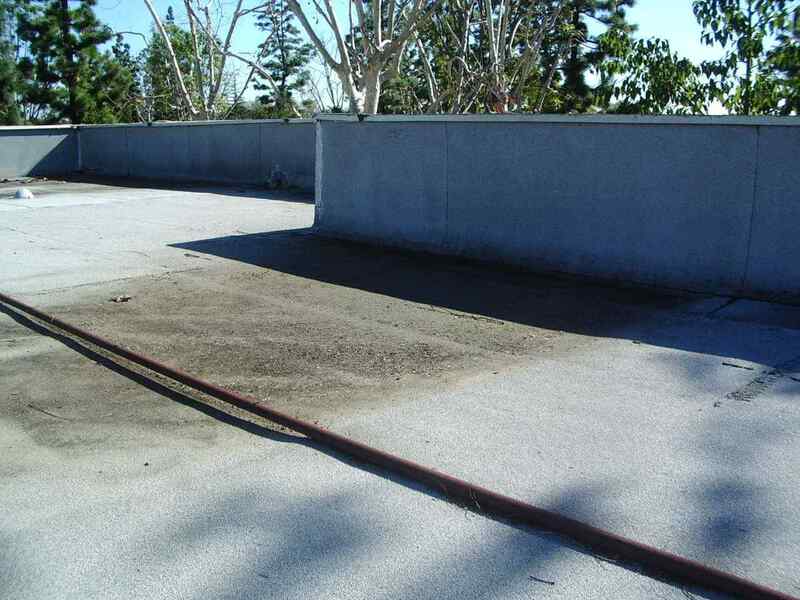 Low spots are a flat roof’s worst enemy because they create the potential for ponding. Ponding is what happens when a low spot collects water from rainstorms and the water sits on the roof membrane for days — or even weeks — on end. 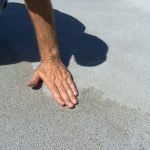 Not only does ponding water invite mold and mildew problems, but it can also damage the roof’s membrane, and even penetrate through cracks or flaws in the membrane and cause damage to the roof’s structure. The results aren’t pretty, and include sagging, leaks and eventually, failure of the roof and possible damage to the interior of the building itself. So Why Do Most Commercial Buildings Have Flat Roofs? If a flat roof can develop low spots that lead to ponding water, why do so many commercial buildings use flat (low-slope) roofs rather than pitched ones? Well, flat roofs are useful, to put it plainly. They can accommodate extra-large air-conditioning units that might otherwise take up valuable real estate that can be put to better uses like parking or storage. A flat roof is also more economical to build and because it reduces the volume of the building, it helps save on energy costs as well. The trade-off is that building management needs to be committed to regular roof inspections and maintenance in order to head off minor problems before they become major ones. 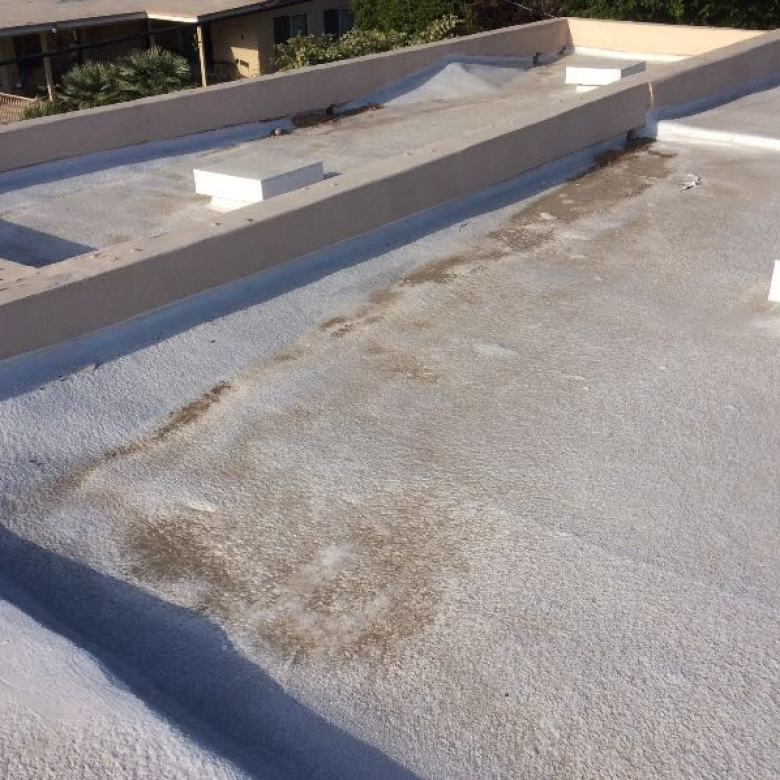 In order for a flat roofing system to perform well, not only does the correct slope need to be maintained but so do components like scuppers (drainage devices that allow water to exit a flat roof through a parapet wall or metal edge and into the gutter system), gutters, downspouts and internal drains. 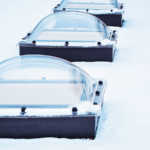 All of these drainage devices need to regular inspection and clearing in order to ensure proper drainage. It’s very important to be vigilant about this once you’ve repaired a low spot in order to prevent it from happening again. RoofSlope is a unique auxiliary compound for restoring positive slope to drainage devices for your flat commercial roof. Not only is it easy to apply, it also provides a durable surface that can be matched to your existing roof’s composition. The patented technology is also UV stable, fast drying, and provides one-coat coverage. 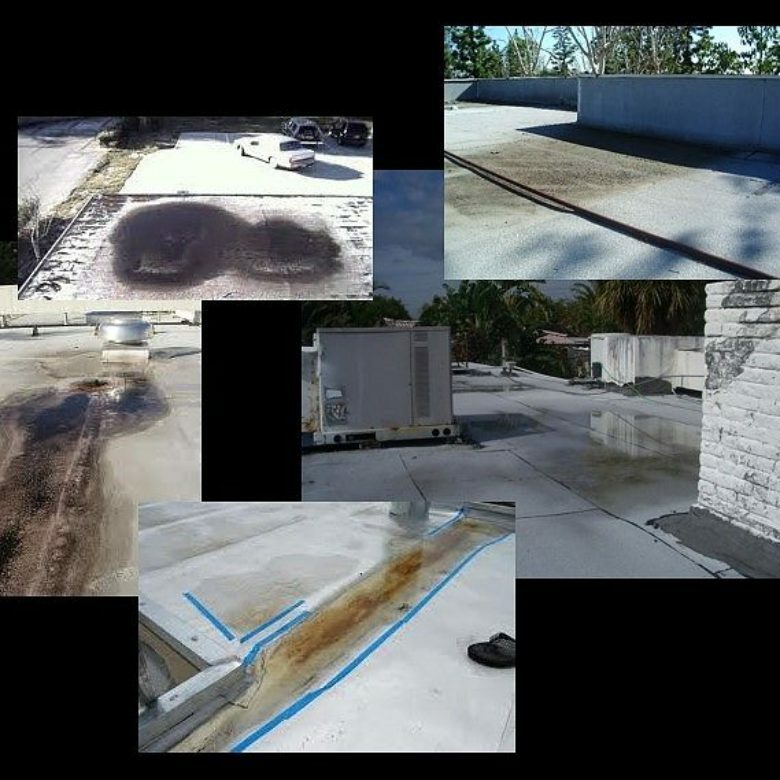 Contact us today to learn more about how RoofSlope can help solve ponding problems on your building’s flat roof.